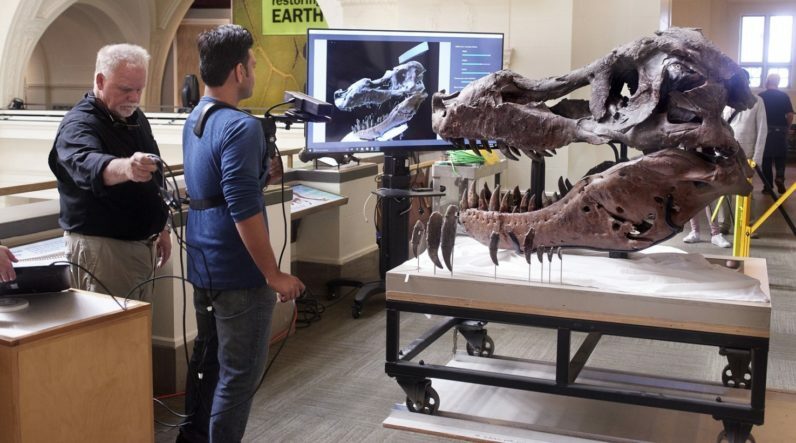 Microsoft’s Kinect is earning some recognition for it’s work with Dinosaurs. The Xbox peripheral was designed as a camera that allows you to control video games with your movements, now it’s been used to map the skull of a Tyrannosaurus Rex. Researchers with MIT’s Camera Culture group realized the equipment they currently had wasn’t capable of getting the information they needed. So they turned to the $150 Kinect to solve their problems. They’d planned to use specialized dental cameras to get a 3D image of holes in the fossil, but the sheer size of the T-Rex skull rendered the current gear ineffective. Undaunted they were able to rig up a chest-mounted Kinect camera and get a full scan. Ghost aren’t real (we hope), but dinosaurs are (we’re sure), and thanks to the Microsoft Kinect the researchers gained new insight into the life of ‘Sue,’ a T-Rex with one of the largest skulls on record. The scientists discovered two previous hypothesis about the creature were likely incorrect. Photographic evidence had lead previous teams to believe that holes in the jaw of the dinosaur skull indicated that it had been the victim of a bite attack. Other scientists had postulated that it was in fact an internal infection that caused the holes. The Kinect scan provided new evidence that disputes both explanations. A lot of people will be able to start using this. That’s the message I want to send out to people who would generally be cut off from using technology — for example, paleontologists or museums that are on a very tight budget. There are so many other fields that could benefit from this. The fact that a video game peripheral can give us new insight into a 65 million year old dinosaur makes it a great time to be alive. Kudos to Microsoft.